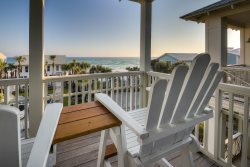 This 2-bedroom condo in High Pointe Beach Resort (#124) offers everything you could want in a vacation rental. Large glass windows offer a dazzling view of High Pointe Beach Resort’s resort-style waterfall pool. Enjoy your morning coffee or evening wine on the pool-front patio while watching the kids play outdoors. Flat-screen TVs, stereo, and plenty of seating for family and friends mean that everyone will be well-entertained and comfortable. The dining table seats 6, and counter-stools at the adjacent bar can accommodate 3 or 4 additional diners. The kitchen offers all of the expected conveniences: Stove/Oven, Dishwasher, Refrigerator, food storage pantry, pots & pans, cutlery, dishes, glassware, and washer/dryer tucked inside the laundry alcove. 3) # bikes are included in the rental. To utilize, waiver must be signed and received before code provided. Please contact Saxon Smith with Bikes 4U 30A at 850.399.1230 with any bike questions. The places are fantastic and customer service is outstanding! Thanks Miranda. We will be back! Miranda was just awesome! The places are fantastic and customer service is outstanding! Thanks Miranda. We will be back! Kimi Homa was one of the nicest and sweetest lady's ever. She was one of the most helpful people this trip. We had alight bulb out in the master bathroom half way through the week and when we got in touch with her she was over within the half hour. I will definitely be renting properties with her in the future and also with 30a escapes. Thank you Kimi for all the help you have made me want to come back. This vacation was one of the most relaxing and enjoyable trips that I have ever taken and I love the awesome pool and my friends and I loved the hot tub as well. The security guards were some of the nicest people and gave us no trouble at all.